Rico Riley was born in Indiana and raised on the shores of Lake Michigan. He began riding his bike at the age of 3 and was able to convince neighborhood kids he could jump over them on a ramp just like his hero Evel Knievel. His love of the outdoors started at a young age as his parents took him on family vacations to the mountains of Tennessee, the caves of Kentucky, and the beautiful woods of southern Indiana. Having Lake Michigan at your doorstep was an amazing thing to have as a child growing up and Rico takes his own children back to this magical place every summer. Rico graduated from Indiana University in 1992 and participated in the Little 500 made famous by the movie Breaking Away. He continued racing after college including several Ironman triathlons with a top finish of 84th in the Ironman World Championships in Kona, Hawaii. In 1995, he received two masters degrees from Arizona State University in Business and Health Administration. Rico worked in corporate America for a while including stints in pharmaceutical sales and finance. In 2001, he found his true calling when his friend Kerry Ecker called him out to help guide a bike ride. This serendipitous call was the beginning of a passion that continues to this day. The passion to provide amazing outdoor experiences and the thrill of adventure. Rico is a registered EMT with the state of Arizona and has earned his series 7, 63, and 65 in the financial world. He has four amazing children, two annoying dogs, and one cat that doesn’t care about anyone. 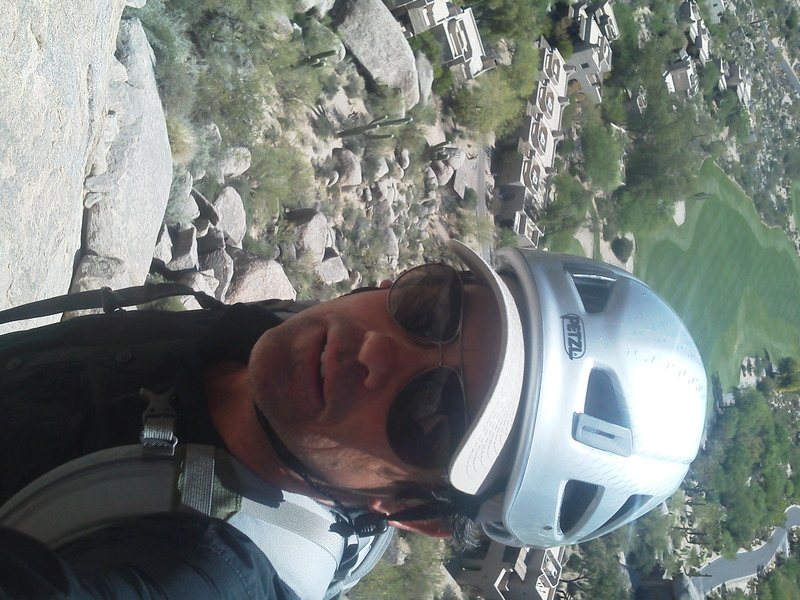 When he is not guiding the amazing guests at the Boulders, he is on the local trails running or riding with the other guides of Black Mountain Adventures. Other hobbies include a love of reading, collecting vintage lunch boxes and all things 1970’s related. The guides of Black Mountain Adventures are dedicated professionals who consider your absolute enjoyment as their #2 priority — because SAFETY comes first. Most Black Mountain Adventure guides are EMTs, and many are members of the local Mountain Rescue team. Most have college degrees, and many hold advanced degrees. All Black Mountain Adventure guides are extremely fit, well-trained, and are seasoned experts in desert hiking, mountain biking, and rock climbing.